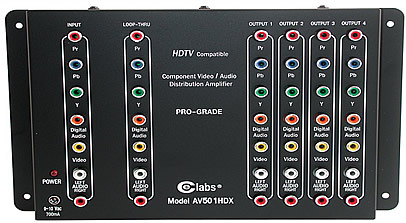 Distribute HDTV/digital video signals from a single A/V source to multiple televisions, monitors and receivers with the 4-Output Component Video Distribution Amp. Daisychain amplifiers together for an unlimited number of television connections without degradation to the picture quality! This amp supports cables runs up to 150ft, providing maximum flexibility. Embedded unity gain technology ensures that the output signal is as clean as the input signal. High-quality and stable signal conditioning eliminates the poor picture and sound quality you get by simply using Y-cables. 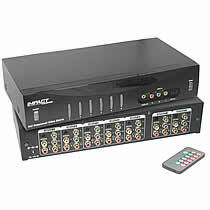 Use these amplifiers with video sources like DVD players, satellite receivers and other video sources. Also useful for distributing audio sources like CD players and tuners for multi-zone sound systems. Perfect for nightclubs, banks, airports, boardrooms, and schools. This selector routes any of six source devices to each TV/monitor or one source to both TV/monitors. Connect all your HDTV products including DVD players, satellite receivers, cable set-top boxes, or gaming systems, and use the remote control or front panel buttons to watch any picture on any two plasma, CRT, LCD or projection televisions with complete independence!ool applications. Distribute HDTV/analog video and S/PDIF digital audio signals from a single A/V source to multiple televisions, monitors and receivers with our 5-Output Component Video Distribution Amplifier. The fifth output can be used to daisy-chain amplifiers together for an unlimited number of television connections without degradation to the picture quality! This amplifier supports cable runs up to 150 feet to provide maximum flexibility. Audio/Video Distribution Amplifiers are specifically designed to deliver the high-quality video and sound that customers demand and expect. Unity gain ensures that the output signal is virtually identical t>> >>o the input signal. Cable runs up to 150 feet are not a problem and multiple amplifiers can be daisy-chained together for a nearly unlimited number of display connections. These distribution amplifiers are ideal for all home theater, boardroom, nightclub, sports-bar and school applications.